How are the 1000 liners supplied? In smaller rolls or packs? There are 10 packs of 100 liners per case. Do you supply any bin liners on rolls? Yes, indeed we do! These can be found under product code 68655. Essential for the busiest of work environments, our Pedal Bin Liners fit in with your current budget. 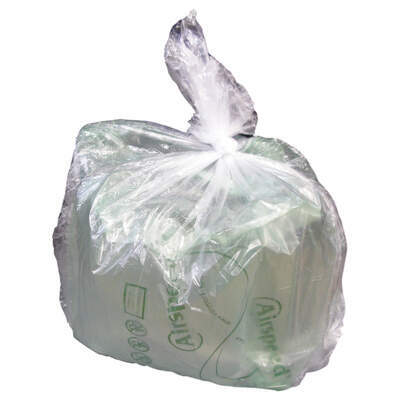 Provided in a large and economical pack of 1000, these white bin liners are constructed from a lightweight plastic that is just 6 microns thick - suitable for light waste disposal. For convenience, the bags are packaged in sets of 100 which makes them ideal for storing until required or distributing around larger workplaces. From office paperwork through to unsoiled nursery rubbish, these bags are the perfect option for your business. Here at Gompels, we have a range of pedal bins to suit your specific needs. So, whether you're most drawn to our Addis Plastic 3ltr Bin, our 16ltr White Pedal Bin or our Matte Stainless Steel 5ltr Pedal bin, you're sure to find the perfect option for your business and at an exceptional wholesale price.